I didn't know where to post this, and this part of the forum seemed the most fitting. I apologise if you think this is unrelated to this particular board. After trying to understand how to maximize a crossbows effectiveness I've came to the conclusion that torsion engines are the way to go, assuming you can call whathever it is you made a crossbow after that. Talisman's Mantis and the manuballista. Seeing both are effectively reliant on torsion engines I've got convinced that I was on the right path. However I questioned the use of the static limbs used on the tradional and handheld ballistas and apperantly on Mantis. My reasoning is that if you can store enough energy in the engine itself it will be very hard to turn due to the stress. Becoming some sort of an anchor -a riser, if you will- that stores useable energy and allowing the bow limbs to bend and store even more energy. The obvious problem could be the torsion engine breaking apart due to extreme stress. However I think that can be managed with the modern materials. What truly worries me is that the possibility of the forces cancelling eachother out if the force vectors are not aligned, effectively making the mechanism useless and ineffective. I realize that this isn't anything traditional, but as I've said: I didn't know where to posts this. Do you think it is possible? Have you seen anything like I've described? Am I overthinking it and it would simply not work due to logical reasons? 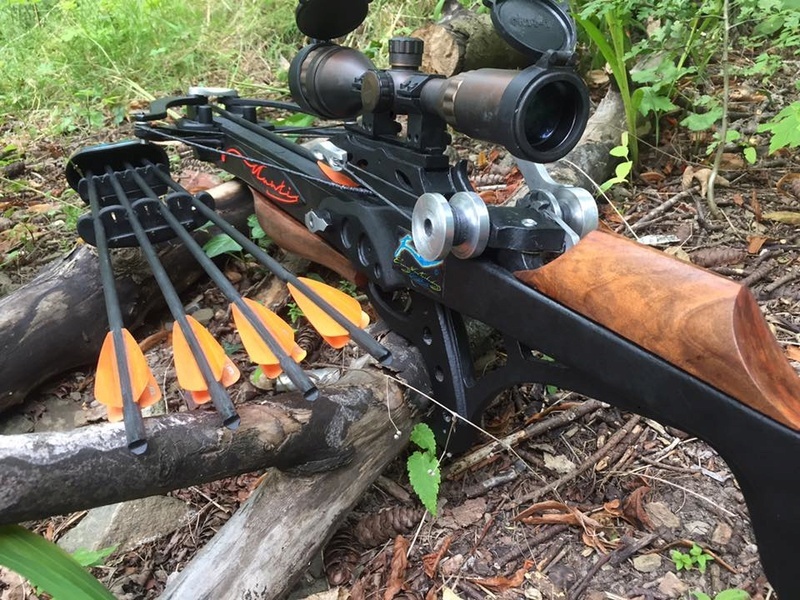 TL;DR: Can you combine torsion engines with bow limbs to shoot faster projectiles? Hello Jacob,i you can adjust the speed to be under 500 fps so it should be legal but you need to be certain.Here is a pic of the new rifled bullet bolt's in 350grn and 450 grn and fitted with the new crown hunting head's,i will do some video's a little later when i get time to show you it all hopefully within the next couple of week's. 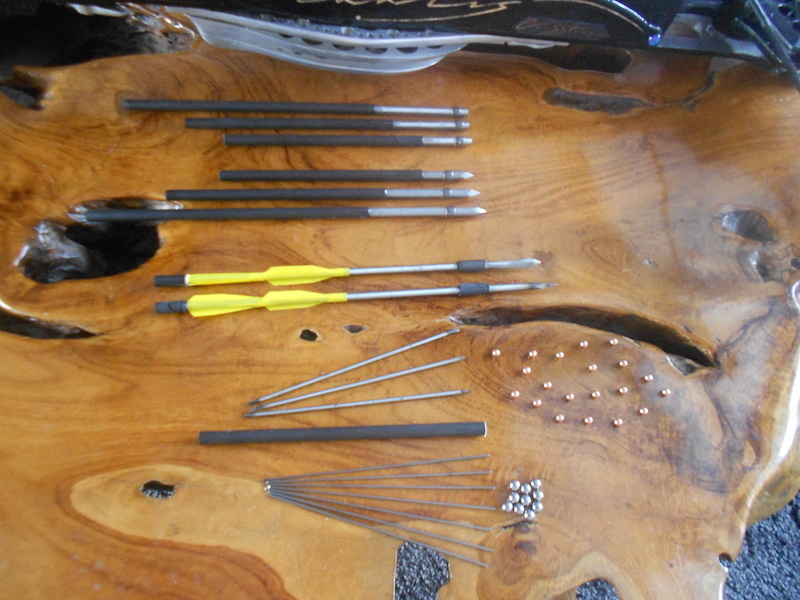 Here are some older pic's of earlier crossbow bullet's and the scatter round's with casing,the yellow fletched bolt's are 700 grn solid 5mm armour piercing bolt's. Sorry I'm asking quite a bit of questions, lol. How does the rifling really affect the bolts? Also, would love to see how you shoot the scattershot projectiles. Do you use a shuttle or a sled? Or just that tube? What happens to the shuttle after the bow is shot? 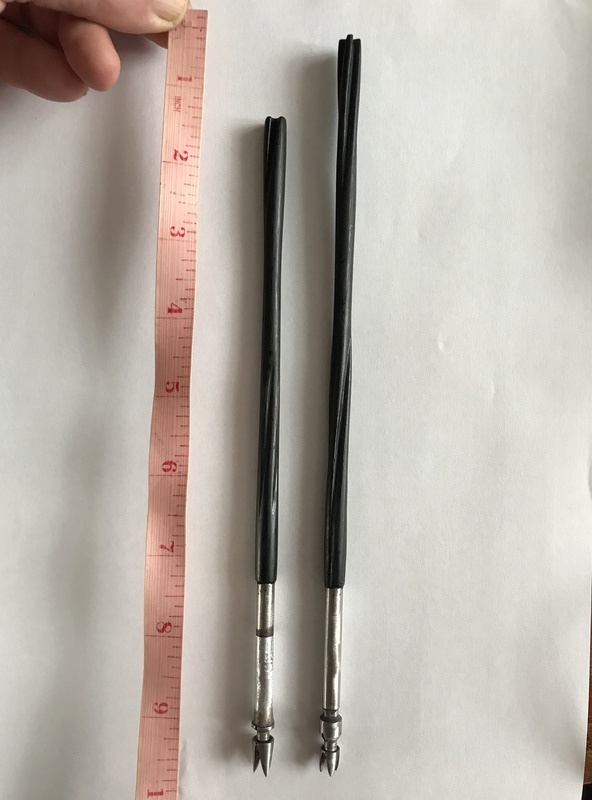 Hi jacob,yes the rifling causes them to spin but i need to fully test them out to see these are just pattern's.O n the scatter round's the tube/carrier can be made to fall just in front of the crossbow if wished by the adjustable choke/brake.Will do some new video's showing it all when ready. Very nice! 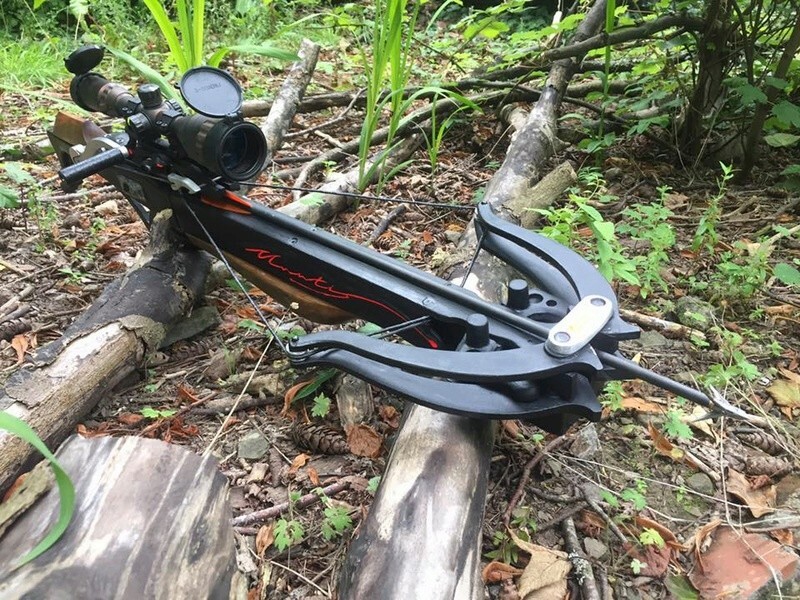 I am very interested in this bow but I sadly don't have the money for it. Basically broke right now, dangit. 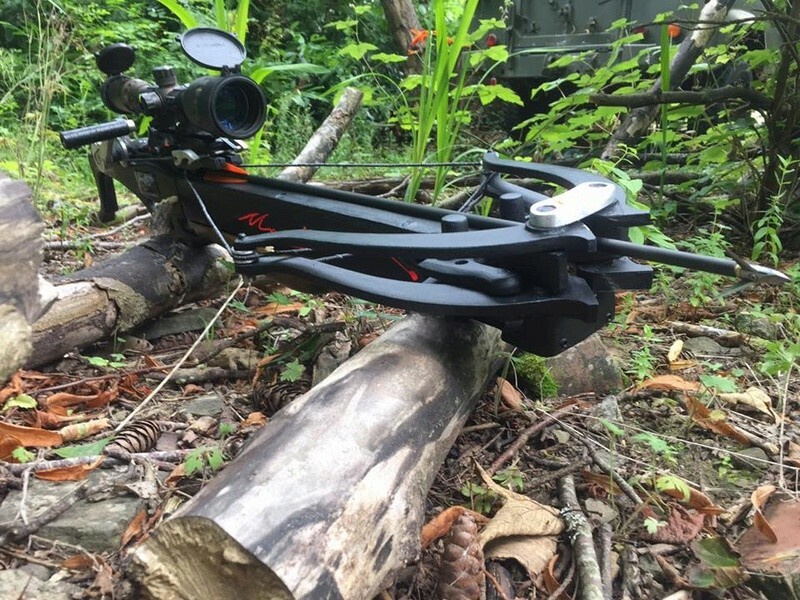 Should I have enough, though, I'll consider giving you an offer, because this is a VERY nice crossbow, and it seems like the perfect choice for my kind of environment, which has lots of brush, and is dense with trees. I'll keep watching the bow, and I'll message you if I make a decision. Again, thank you so much for answering all my questions, Phil! No worrie's Jacob may i thank you for your interest in this new kind of crossbow,over the year's around 8 year's ago when i made the very first recurve prototype it blew me away with it's look's and high power but now have come a very long way sinse then and i stuck with it as i alway's believed this approach.Had a lot of negativity on CBN from some but it did not put me off,lol.Wish Lightfoot was back on here as he was going to become a dealer in Canada still maybe he'll come back on here,hope so. Well like I said I'll be sure to message you in the future as I am heavily interested. 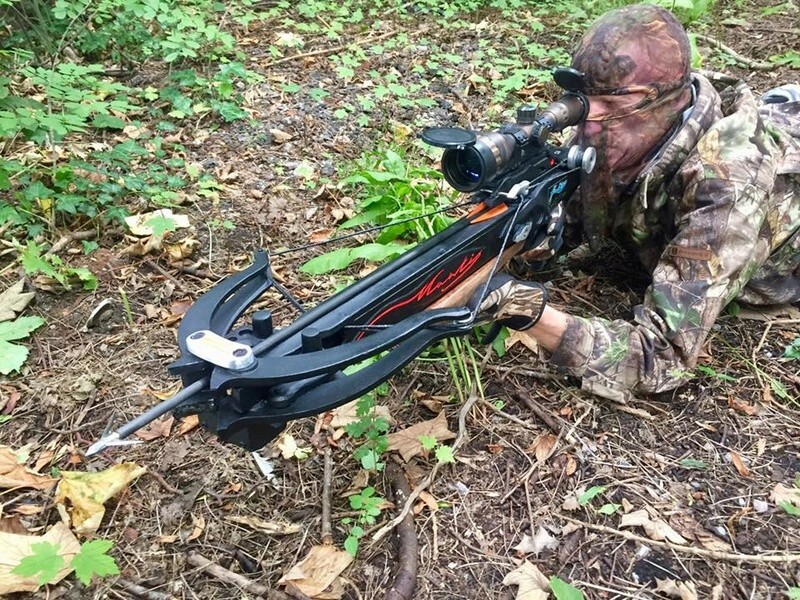 I'm sure the folks on CBN probably pulled the old ''It's not a real crossbow'' card, but then again it is way more of a crossbow than the Pioneer Airbow. Otherwise, the only reason I'd be against it would be bolt cost. Then again, seeing you smaller rifled bolts, I'm sure that problem is fixed. Either way I'll let you know if I want to look into it or not once I get the money. Thanks for all the information, Phil ! Thank's Jacob i refer to it as a mech bow a mechanical bow that pivot's.It's the very first production torsion type of crossbow so something newish,lol.On bolt's it is one very easy bow and very forgiving even when set on the very highest power setting it is very kind to arrow's/bolt's and you set the speed you want or need from it. Sounds like a pleasure to shoot. 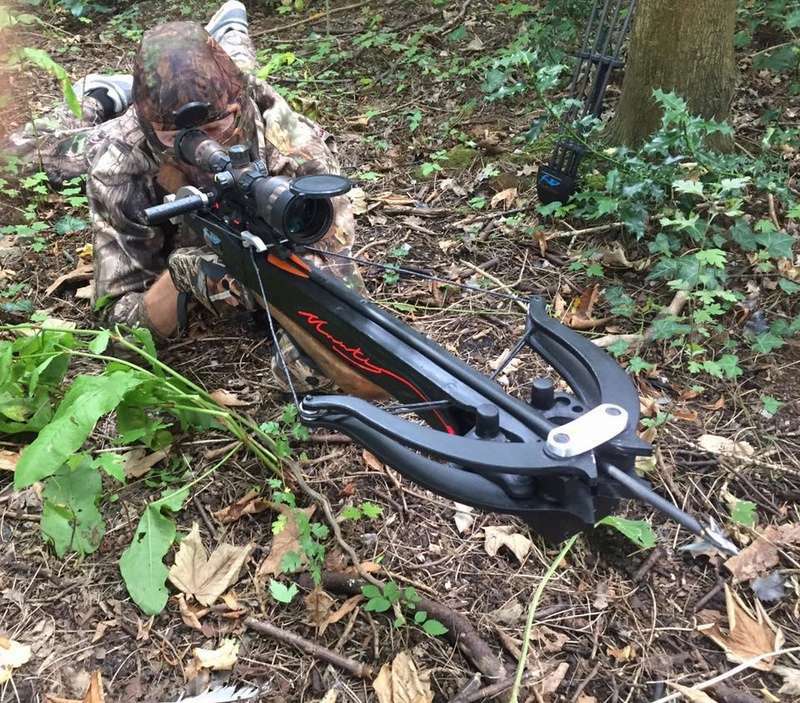 I know the old crossbow I have has a tendency to yank itself downwards when shot, and 9/10ths of the time I find the bolt stuck in the ground, sadly. Any kind of recoil when shooting? There is no recoil at all and it is extremely quiet to shoot too,i cant wait to try out these new design rifled bullet bolt's to see how accurate they are and they will be very cost effective unlike arrow's. Sounds like an absolute joy to shoot. Well, I'll see what happens once I get enough funds saved up in the future. For now, though, thank you so much for all the help, Phil, I had quite a bit of questions, and you answered all of them. Hope to see the Mantis make a good spot for itself here in Canada!